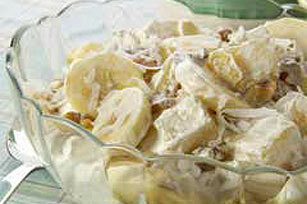 A bit of syrup brings out the natural sweetness of bananas, pineapple and coconut in this Tropical Dessert. Beat whipped topping and syrup in large bowl with wire whisk or electric mixer on medium speed until well blended. Add fruit, coconut and walnuts; stir gently. Cover. Refrigerate several hours or until chilled. Garnish with orange zest just before serving, if desired. For more flavor, toast the coconut before using. Just spread the coconut evenly into shallow baking pan. Bake at 350°F for 7 to 12 minutes or until coconut is lightly browned, stirring occasionally.